Location: Prefers Chicagoland Market & Midwest Market. Misc. : MUST MEET ABOVE CRITERIA!!!! All Referrals & Pocket Listings Protected. Strong Cash Buyer - Quick Close!!! Location: Chicagoland Market Only!!! NO COOK COUNTY!!! Location: Glen Ellyn within a 3 Mile Radius. Size: 3,000 – 4,000 SF space. Deal: Looking to lease and/or sublease space. Need Retail Center Properties Located in the Chicagoland Market!!! Price: $ 5,000,000 - $ 6,000,000; will do multiple transactions. Strong Credit 1031 Cash Buyer. Lease Term: 15+ Years Minimum Term Must be Corporately Guaranteed w/ Strong Credit Tenants. 1031 Cash Buyer Seeking NNN Single Tenant Properties $5-6M!!! Must be Corporately Guaranteed w/ Strong Credit. NEED 2,500 - 4,000 SF OFFICE SPACE!!! 1031 Cash Buyer Looking for Strip Centers in the Chicagoland Market!!! Seeking NNN Single Tenant Properties!!! 1031 Cash Buyer Seeking NNN Single Tenant Properties!!! Lease Term: 15+ Years Minimum Fixed Term. Strong Credit Tenant. 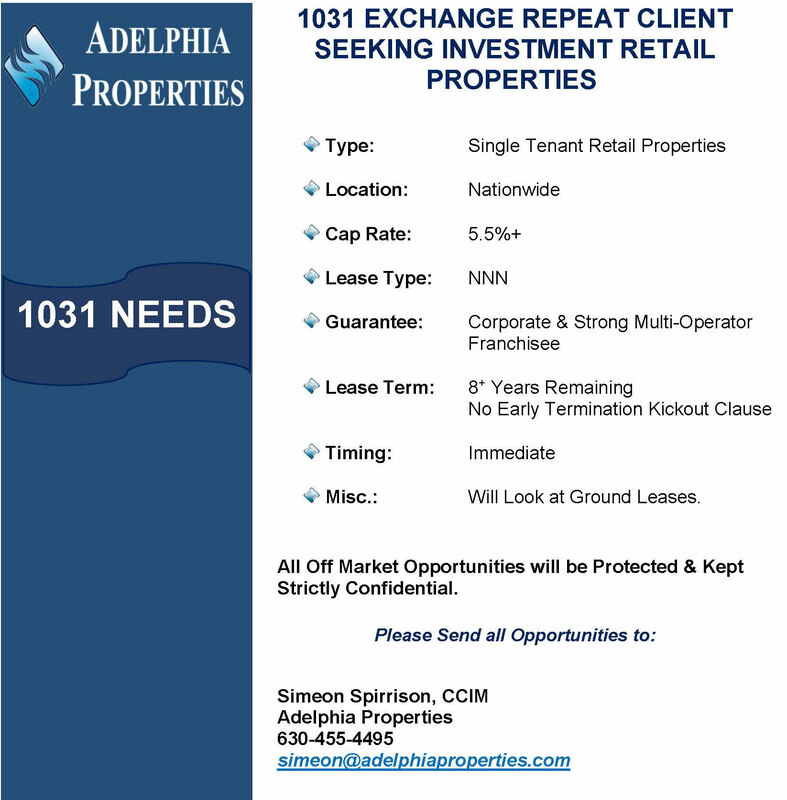 Type: NNN Lease Deals Only. Strong Credit 1031 Buyer. Can Close Quickly. 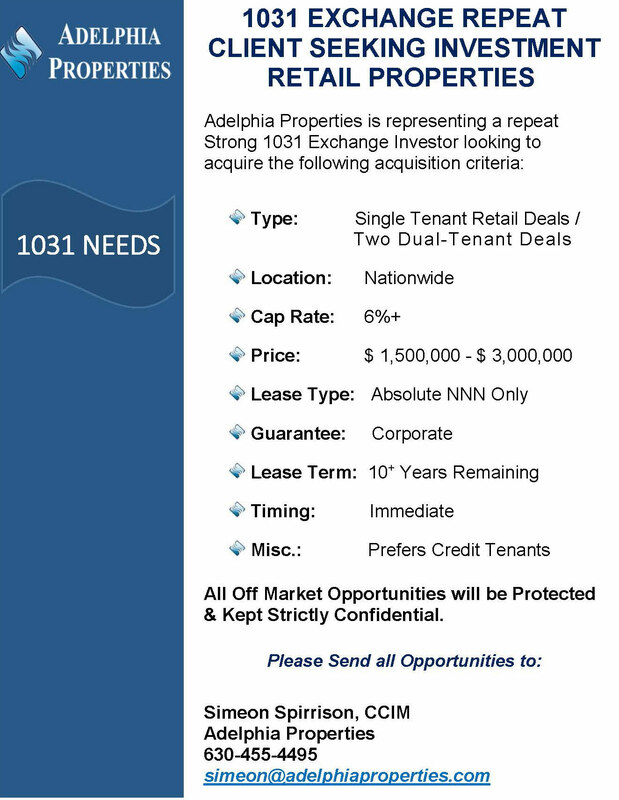 Please submit all prospective opportunities via email to: simeon@adelphiaproperties.com. Type: Industrial Warehouse Building with Some Existing Refrigeration. Location: Needs to be in the O’Hare Market w/ easy access to I-294 Expressway such as: Elk Grove Village, Bensenville, Addison, Wood Dale, Itasca, Rosemont, Franklin Park, Schiller Park, Northlake, Des Plaines. Size: 8,000-20,000 SF w/ some Existing Refrigeration aMUST. Type: Looking to Buy or Lease w/ Option to Buy. Miscellaneous: Need Loading Docks/Drive In-Door. NEED NNN INVESTMENT DEALS NATIONWIDE!!! 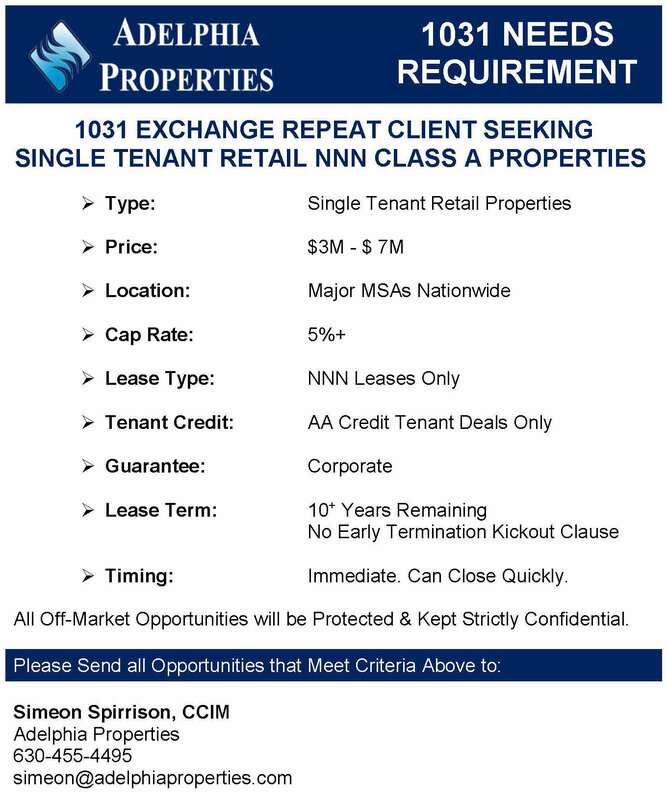 I have a Repeat Client Looking to Purchase Single Tenant NNN Leased Properties Nationwide. LEASE TERM: 10+ Years Minimum Fixed Term w/ Options. CAP RATE: 6.5% Actual Cap Rate or Better. No Performa’s. LEASE TERM REQUIREMENTS: 15 Years Plus Remaining on Initial Term w/ Options. Must be Corporately Guaranteed Lease. CAP RATE: 7.25% Actual Cap Rate or Better.No Performa’s. ADDITIONAL INFORMATION: Strong Credit 1031 Buyer. No Chains Please either Principals or Direct Brokers. PROPERTY TYPE: Strip Centers & Shopping Centers. PRICE RANGE: Between $2 - $8 Million. CAP RATE: 8% Actual Cap Rate or Better. Will look at Value Added Opportunities. PROPERTY TYPE - 2nd Generation Restaurants. LOCATIONS - Prominent Dense Retail Corridors in IL such as: Oak Brook, Schaumburg, Naperville, and etc. High End Multi-Unit Operator Client. PRICE RANGE: Between $3 - $8 Million. ASAP: Need Apartment Buildings in IL!!! PROPERTY TYPE: 6 – 8 Unit Apartment Buildings. CAP RATE: Must make sense. LOCATION: Only in DuPage & Will County in IL. ADDITIONAL INFORMATION: Strong Credit Buyer can Close Quickly. All pocket listings shall be protected. 6,500 SF TURNKEY BREAKFAST/LUNCH OPERATION | Outstanding Frontage, Visibility & Demos | Priced to Sell!!! 6,000 SF Freestanding Building | Great Site Opportunity | Outstanding Frontage & Visibility on 1.02 Acre Lot | Priced to Sell!!! 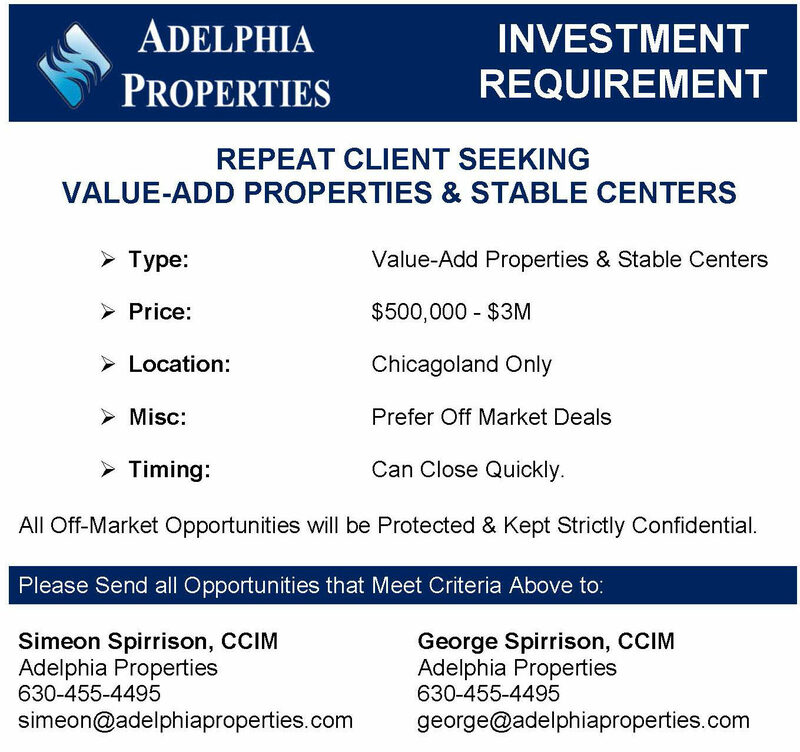 RIVER ROAD CENTER | A+ Prime Chicagoland Location | 11.67% Cap Rate!!! Comments: Closed in under 21 Days!! !